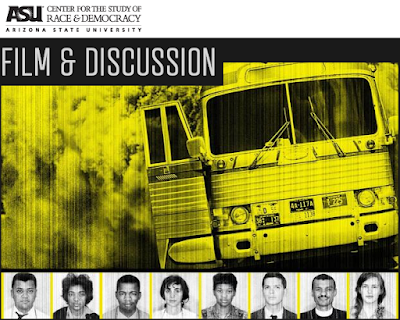 We encourage you to take part in the next ASU Center for the Study of Race & Democracy Created Equal Film Series screening and discussion of Freedom Riders, March 18 at ASU's Downtown Phoenix campus. About the Film: Attracting a diverse group of volunteers—black and white, young and old, male and female, secular and religious, northern and southern—the Freedom Rides of 1961 took the civil rights struggle out of the courtroom and onto the streets of the Jim Crow South. Freedom Riders tells the terrifying, moving, and suspenseful story of a time when white and black volunteers riding a bus into the Deep South risked being jailed, beaten, or killed, as local and state authorities ignored or encouraged violent attacks. Watch a preview and find additional details at http://csrd.asu.edu/freedomriders.